Have you ever been completely consumed with something? I have quite a few times. Usually over things I’ve eaten and just can’t get out of my head. Almost two years ago I had a pie that blew my mind. I was up at my family’s cabin in Wisconsin. They had purchased a local apple pie from Elegant Farmer to have as dessert one night. Apparently there’s a cult following around these pies and for good reason. WHAT DO THEY PUT IN THESE PIES?! Crack. It has to be crack. Ok, it’s not crack but I’ve seriously never had a pie like this before in my life. The way I see it, you’re either team pie or team cake. I’m definitely the former. Sorry cake lovers, give me pie ALL DAY EVERYDAY. And this pie… it has the most unique top crust. It’s what pie dreams are made of. It’s so thick, so crunchy that you literally have to stab it with your fork to break it into bite sized chunks. 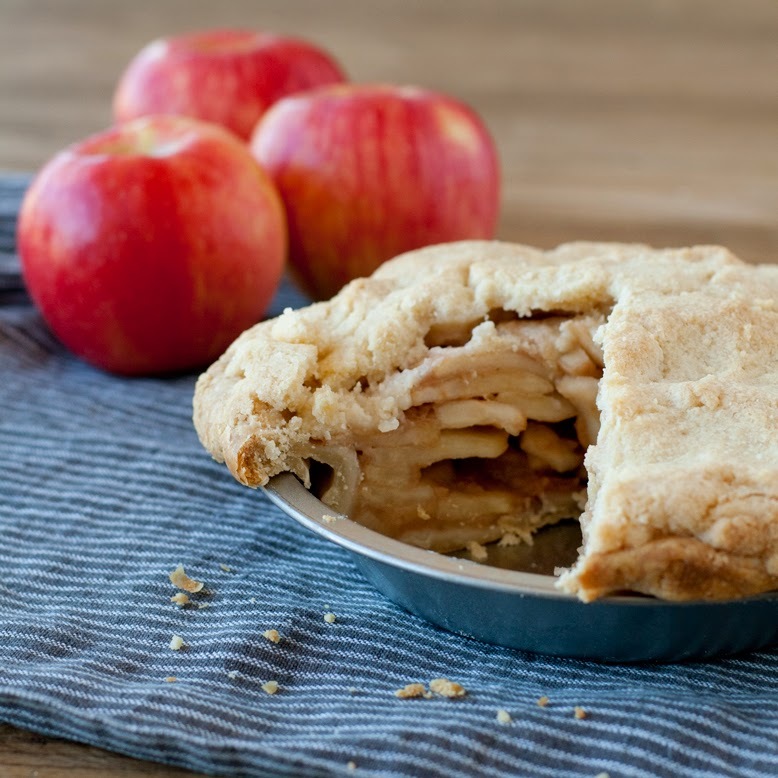 The first bite fills your mouth with perfectly cooked apples that magically still have all their texture, kissed with caramelized sugar and cinnamon and you bite down on that perfectly crunchy top crust and it’s impossible not to have a moment. A perfect, sublime, apple pie moment. Where your world is changed forever because you never knew apple pie could be like this. It’s a game changer. 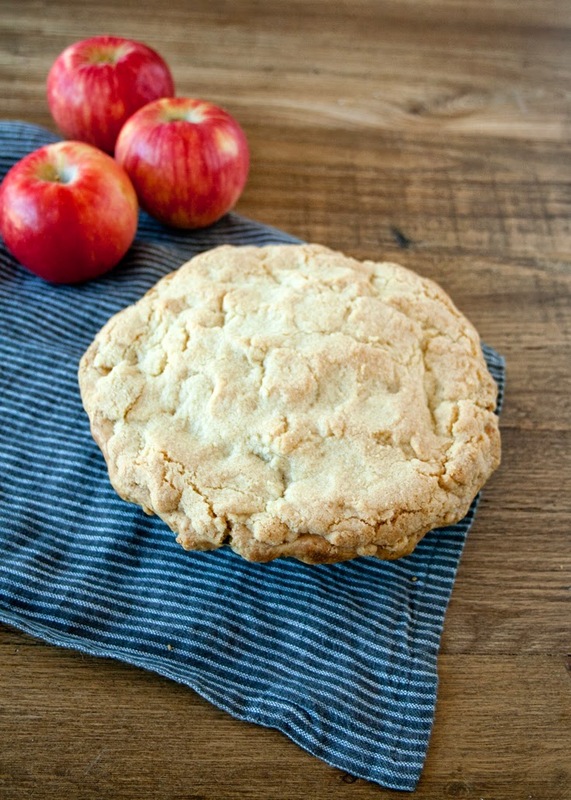 So the next time I made an apple pie, I scoured the inter webs for a copycat recipe. I was pleasantly surprised that not only was there a recipe online, but that Elegant Farmer Apple Pie in a Bag had been on a Throwdown with Bobby Flay. DONE. Made the pie that night. But those sneaky, sneaky buggers didn’t give us all their secrets. Because the pie I made turned out nothing like the pie I ate that chilly fall night in Wisconsin. A few months ago I set out on a mission. I went up to WI for my anniversary and my husband and I brought back an apple pie and I went to town. I did my homework and hit the flour butter game hard. I made over 12 pies, tweaking my filling and top crust until I nailed it. And just to be sure, I made 2 more pies with subtle variations and compared them side by side to the original Elegant Farmer Apple Pie. Yep, we had a 3 pie taste off. We ate so much pie for a few months there. But I was all-in, completely consumed in replicating this pie because I HAD TO HAVE IT. I have to say, I nailed it and even made it slightly better than the original. But that’s just my biased opinion. IT WAS WORTH IT! Can I be honest with you? Pie crust isn’t something I’ve mastered yet. I can’t wait for the day that I can confidently share with you a fool-proof recipe for pie dough. Until that day though, I have a secret to tell you… this recipe, it doesn’t really matter what type of dough you use for the bottom crust. I used…. shhhhhh, store bought *gasp*. I’ve tried with both frozen and fresh and either work just fine. YOU CANT EVEN TELL. I promise. Because the hero is the top “crust”. Which is more sugar cookie dough than crust, but not as sweet. It’s magic AND easy. So if you, like me haven’t mastered the art of pie dough yet, this pie is for you. Not to mention, it’s the perfect pie for Thanksgiving or any holiday party you’re attending or hosting. I’m not usually one for shortcuts but this bottom crust is the exception. Also, don’t be scared but you bake this pie in a brown paper bag. Yes, a brown paper bag at 400º F no less. The first time I made it I stalked the oven because I was sure it would end in me burning down my kitchen. Much to my surprise, it didn’t. The bag makes the texture of the apples magical and somehow the top crust still gets golden and beautifully browned. Don’t question it, just follow the recipe and be pleasantly surprised. If that wasn’t enough, I even went the extra mile and figured out how to make a small apple pie if you, like me can’t be controlled when delicious sweets are around. This recipe scales down to a 7” pie too which feeds 4 people obnoxiously or 6 people sensibly. Or… serves you & your boo dessert 2 nights in a row, that’s how I roll. Just halve the ingredients and that 9” pie becomes a small 7” pie. It doesn’t seem like 2” makes a big difference or that 2” should be half the amount of ingredients but it works. Don’t ask me how, it just does. Kind of like that brown bag thing. I hope you guys have an amazing Thanksgiving filled with friends, family and all the ones you love. Oh, and this pie. 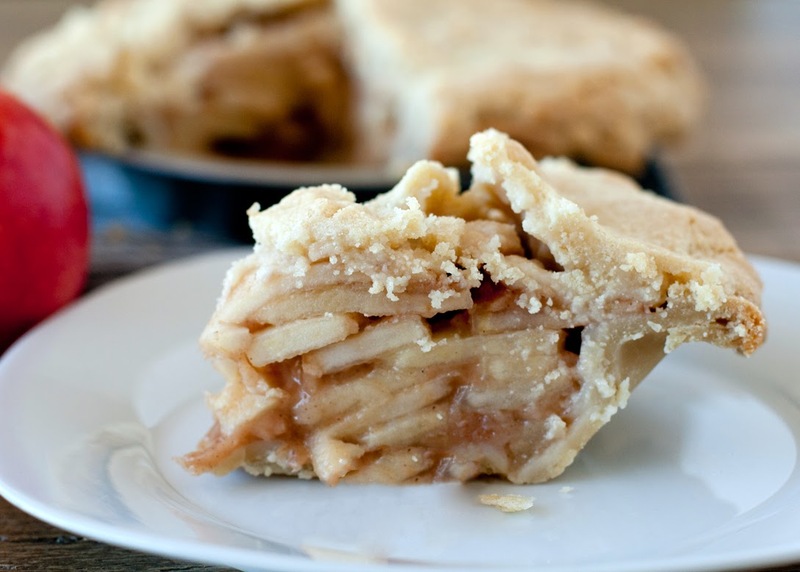 Because it will be your new favorite apple pie, I just know it! Preheat oven to 400º F. In the meantime, start by assembling your top crust. 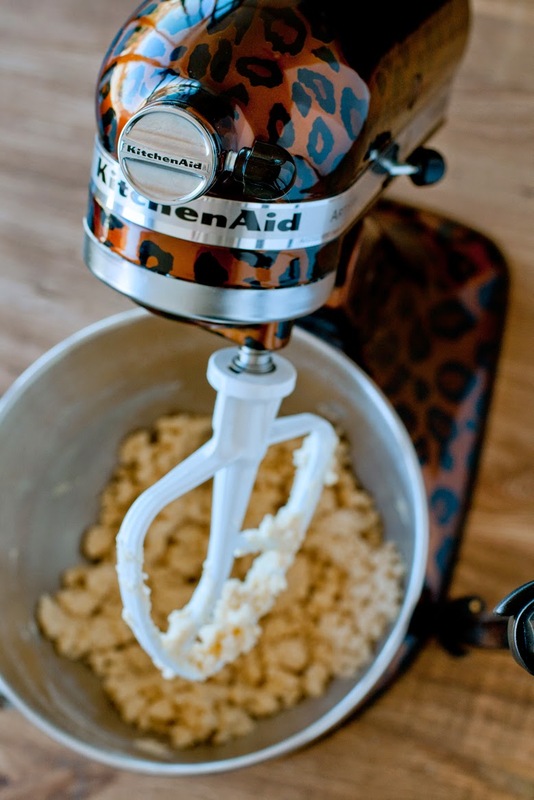 Combine all ingredients into a mixer with the paddle attachment. 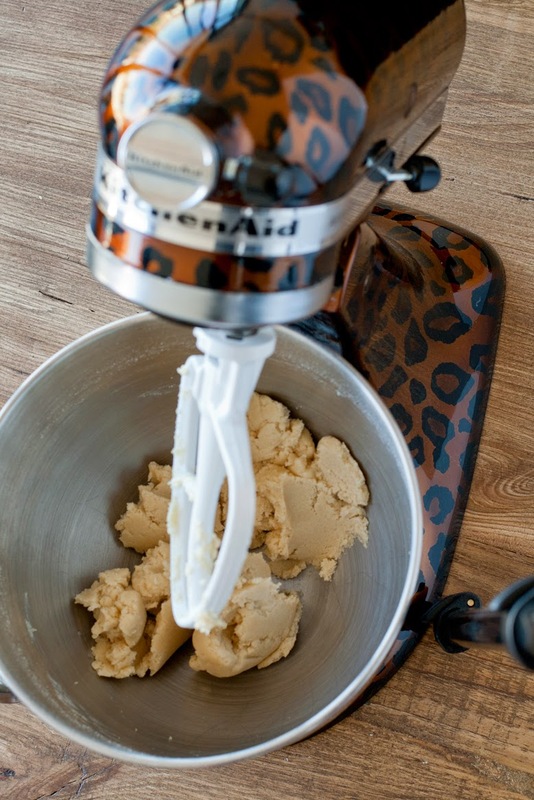 If you don’t have a stand mixer, you can do this with electric beaters. Give the mixture a few minutes to come together. At first it will look a bit dry but after about 2 minutes in the mixer. But it will come together like a soft dough, sort of like a sugar cookie dough. Set aside and begin to prep your filling. I like to use an apple slicer peeler corer but if you don’t have one a peeler and knife will work just fine. I like to slice the apples about ¼” thick and halve the slices so you have long, stackable slices. I find it gives the best texture when eating the pie. Cut your apples however you prefer, really it’s all about preference. Once the apples are sliced, add the remaining filling ingredients. Stir to combine and let sit about 5 minutes. Grab your bottom pie crust. It really doesn’t matter if you use your favorite recipe, a frozen or fresh store bought version. The hero of this pie is the top crust. 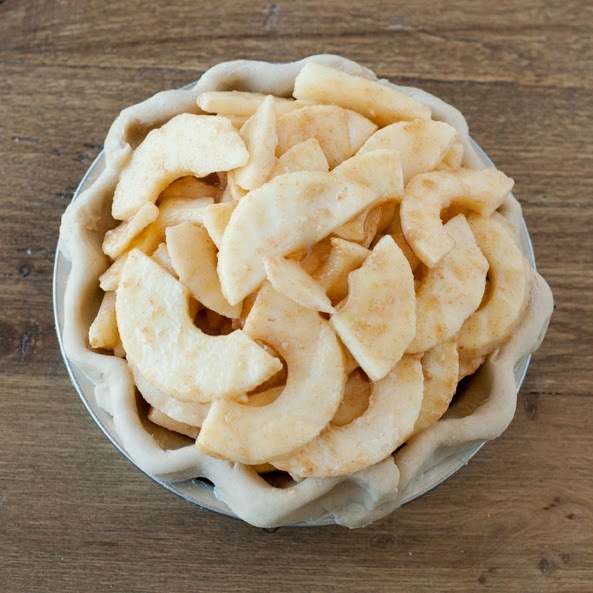 Pour your apple mixture in the bottom of the pie shell and spread into an even layer. It should be heaping over the top. Grab about half of the top crust mixture and work it with your hands to flatten it out a bit. 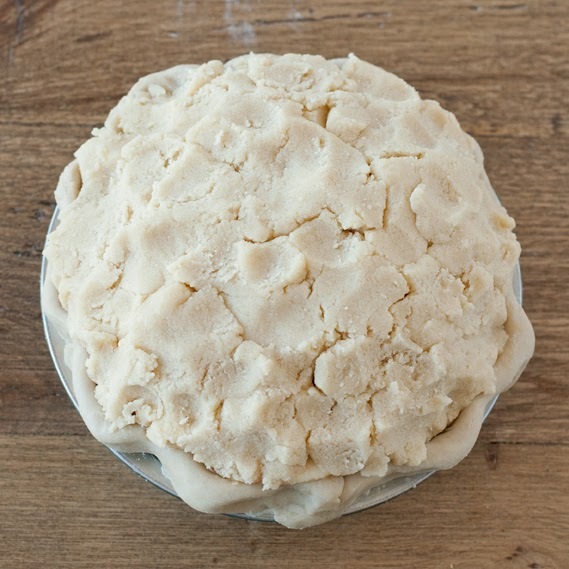 Place on top of the pie and do the same with the other half of the dough. Spread it around with your hands so that you completely cover the apples and bottom crust. It’s really easy to manipulate the top crust mixture. Just pull it, spread it around. It’s not something you have to be gentle with so don’t be scared. 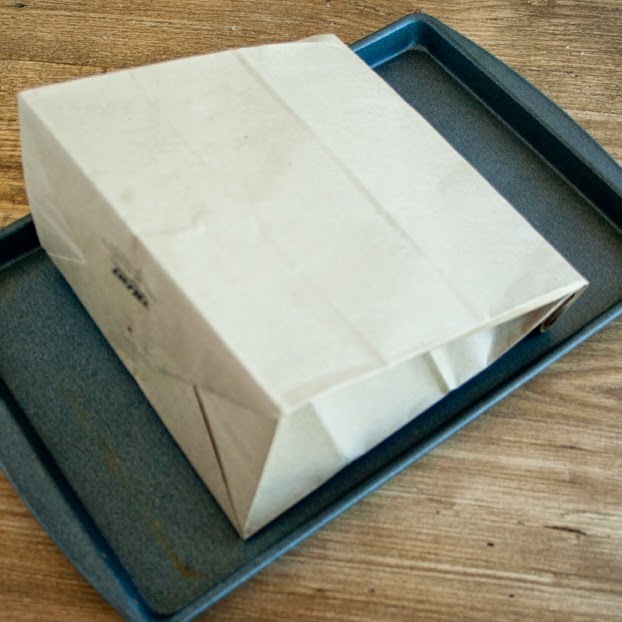 Place pie in a large brown paper bag. Fold the opening closed. If you can’t get it to stay down, feel free to staple it shut. I find that just folding it a few times and tucking it in the bottom works just fine. Place on a large baking sheet and put in a 400º F oven for 1 hour 20 minutes. Make sure the bag isn’t touching the sides of the oven. Once the pie is done baking, pull it out of the oven and immediately cut open the top of the bag. Be careful not to burn yourself on the steam as you do this. I usually take a paring knife and cut a circle shape at the top and rip it away from the pie. Let it come to room temperature and then place in the fridge until ready to eat. I find this pie is good warm but it’s excellent chilled. 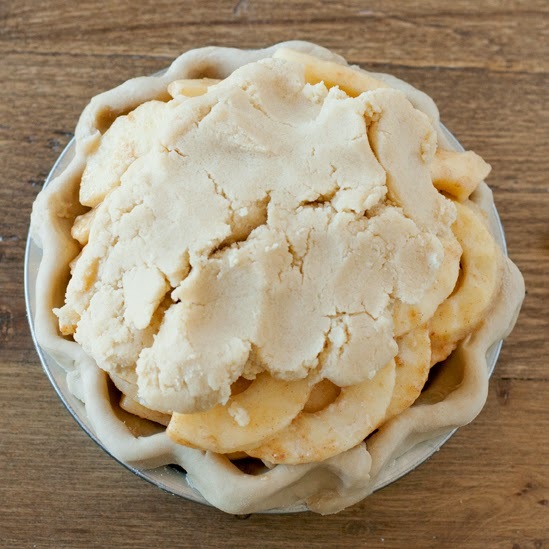 By refrigerating the pie, the top crust gets extra hard and crunchy which is what makes this recipe so unique. To make a 7” pie cut the ingredients in half. i call for a combo of granny smith & honeycrisp apples but i’ve made this with a different variety. use what you have on hand or what’s available in your grocery store. stay clear from apples that don’t bake well like red & golden delicious. stick to a firmer, more tart apple. sometimes i like to add salted bourbon caramel sauce in the filling. i highly recommend trying that sometime too! start with ¼ c. and see how it turns out. you can always drizzle extra over the top. or try adding in 1-2 TBSP bourbon to the apple filling. bourbon just makes everything taste better, amiright?! What rack do you place it on in the oven? Middle rack. Make sure your top rack doesn't touch the bag. I have to take mine out. I've had the Elegant Farmers pie! It's fantastic! Have you tried their caramel apple pie?!?!? It's all delicious! Thanks so much for posting this! I love all your blog posts, but seldom comment! Thanks so much Katie. I haven't had the caramel one but I've put bourbon caramel in this recipe and it's so good! Thanks for following. Your comment made my day! Can I use the crust as a bottom crust for a chess-style pie? Hi Amy. I don't think the top crust recipe would work but it's possible. It's more of a cookie dough than a pie so I think the gooey buttery filling of chess pie plus that soft crust might not turn out like a traditional pie. If you do try it as a fun experiment, let me know how it turns out! It's all delicious! Thanks so much for posting this! so I decided it was a perfect time to try some home-canned apple pie filling. I found a perfect recipe on Skip to My Lou and got to work! I checked mine at 1 hour ten minutes and it was burnt. I checked my oven temp with a calibrated thermometer and the temp was accurate so it was not my oven. An hour 20 minutes is way too long at 400 degrees. I'm so sorry that happened for you. I'm not sure why because I've had many people make this recipe successfully without any issues. I want to start by thanking you for your hard work. You have saved us all a trip to Wisconsin for the pie! That you had the pie and worked so hard to get it right, I should be paying you for this information. As far as the brown bag technique, my mom used that for making garlic bread. It made the best toasted garlic bread. Never thought of using it on a pie, so that's next on my list! Thank you so much for this. looks like they use A LOT more sugar than my recipe calls for. thanks for finding and sharing. i still think my recipe is better, but that's the beauty of improv kitchen. you craft recipes to YOUR taste. cheers! This appears to be something you might want to read. There is a book called "The ABC's of Brown Bag Cooking." Very interesting article.